It’s always a thrill when new photos and memories of Kevin Ayers come to light. 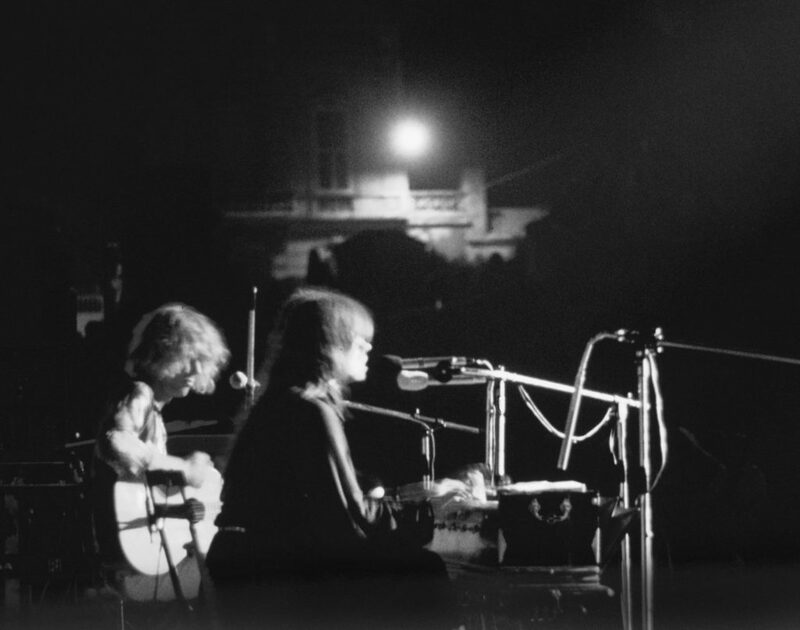 We were delighted when Roy Perring got in touch recently to share his unique pictures of Kevin and German musician/chanteuse Nico at the Arles Festival. For the sake of completeness we have included all the photos that Roy sent us, even though some are quite similar to each other and one is are a bit blurry. We think they are wonderful! 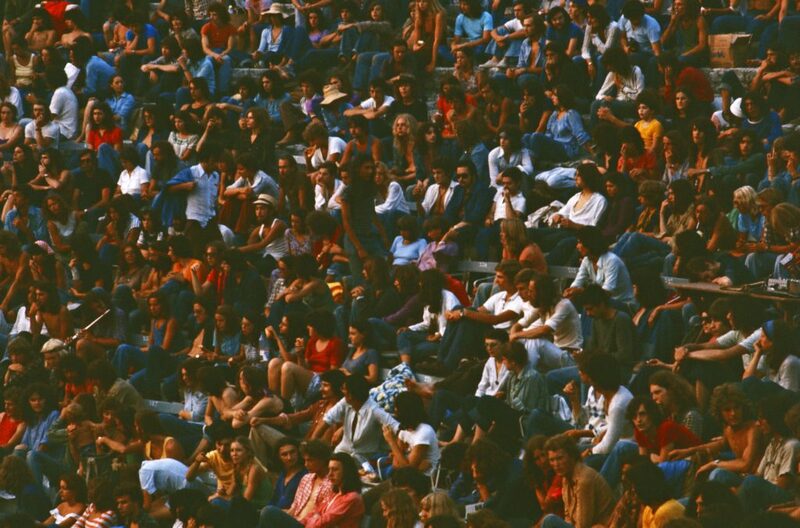 Read on to enjoy Roy and friends’ reminiscences of Arles ’75 as well as a few notes about Kevin and Nico. 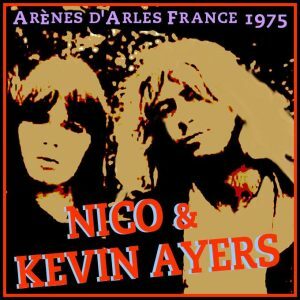 Kevin Ayers and Nico were friends and most probably (almost definitely) lovers at some point. When and where they first met, possibly New York, during Kevin’s time with Soft Machine, maybe Paris or even St Tropez… is a curious question, waiting to be answered. Nico sang on the track ‘Irreversible Neural Damage’ on Kevin’s 1974 album ‘The Confessions of Doctor Dream and Other Stories’, released on Island records. There is indeed a story about her being so stoned during the session that she was recorded lying down on the carpet! Nico and Kevin collaborated again as part of the so-called ACNE project (Ayers, Cale, Nico and Eno) which led to the famous June 1st 1974 concert and accompanying live album. What was so fascinating about Nico? Born Christa Päffgen in Cologne, Germany, on 16th October 1938, Nico was a singer-songwriter, musician, fashion model, and actress who became famous as a Warhol “superstar” in the 1960s. She is known for her vocals on “The Velvet Underground and Nico” (1967) and her work as a solo artist. Nico’s early life was marked by the events of the Second World War. When she was two years old, Nico moved with her mother and grandfather to the Spreewald Forest outside Berlin to escape the bombardments of Cologne. Her father was enlisted as a soldier and suffered head injuries that caused severe brain damage. Irreversible Neural Damage? He died in a psychiatric institution. Nico began working as a model in Berlin during her teenage years; her height (5’10”), pale complexion and high cheekbones soon attracted the attention of photographers and media types. She moved to Paris and then to New York. Nico had roles in several films, including Federico Fellini’s ‘La Dolce Vita’ (1960) and Andy Warhol’s ‘Chelsea Girls’ (1966). She had a child by French actor, Alain Delon and a relationship with Jim Morrison, who wooed her in the Californian desert and encouraged her to write peyote-fuelled poetry. Nico’s singing voice was very distinctive in an era of talented female vocalists such as Joni Mitchell, Grace Slick etc., in the sense that there is little warmth in its tone, the delivery is unemotional, haunting, almost robotic, yet very beautiful. Her stage demeanour was aloof, cool and sometimes confrontational. Kevin Ayers, as we all know, was born in Herne Bay, England in 1944. His parents separated when he was very young, with his mother suddenly leaving home. After some time spent with his grandmother, the story goes that our Kev (then aged about six) eventually joined his mother and her new partner in Malaysia, after a long train journey on his own via India and Bangkok. So here we have Kevin and Nico, two “War Babies” both with traumatic incidents and colourful events in their pasts, who felt the urge to write songs and perform. Neither had a formal training in music. The avant-garde 1960s scene had nurtured their creativity. In 1975 both Kevin and Nico were signed to Island records. Nico was pursuing a solo career post-Velvet Underground, often working with John Cale. Her 1974 album ‘The End’ was released by Island. We don’t know for certain who booked Kevin to perform with Nico in Arles, although it was during this period that John Reid, also manager of Elton John, was trying to promote Kevin as a mainstream artist. The historic town of Arles, in Provence, southern France is famous for its impressive Roman monuments including the Arènes (arena or amphitheatre) which dates from the 1st century BC. During the 4th century AD the Roman baths of Constantine and the necropolis of Alyscamps were built. Arles is also famous as the place where Vincent van Gogh painted many of his masterpieces. 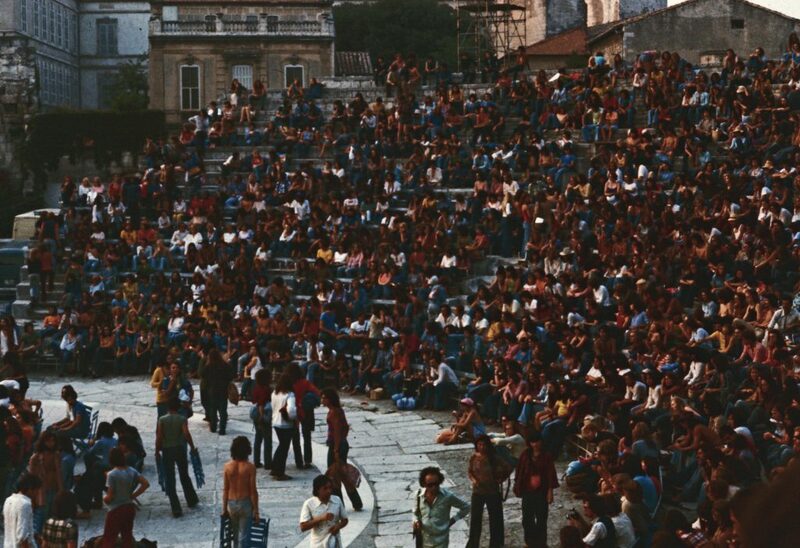 The Arles Photographic Festival is another cultural contribution and in 1975 the Music Festival was evidently part of the summer programme of events. 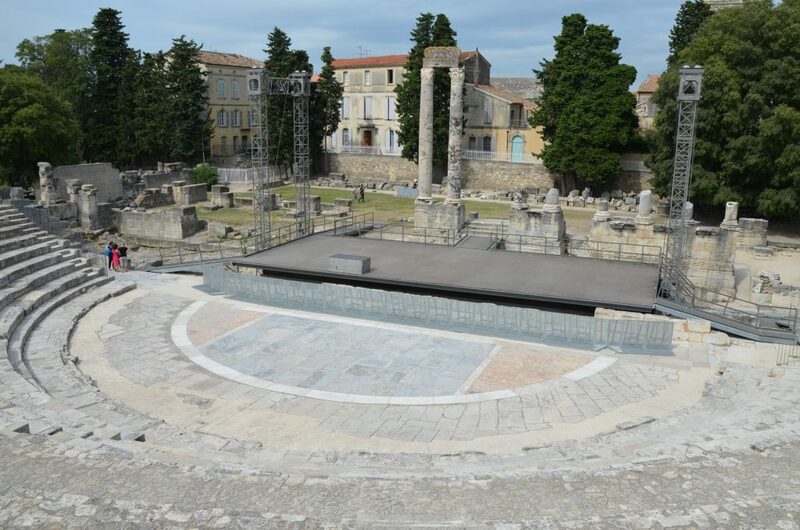 After some reflection and research on Google maps, Roy confirmed that the concert was actually held at the Theatre Antique, just across the road from the famous amphitheatre and not in the amphitheatre itself, as we had previously thought. “It was a very hot summer in 1975, and seven of us had set out in a hired people carrier from Plymouth via Roscoff in France to Spain. Pre-punk, we were still in the club era that had led on after the ‘Summer of Love’ in the sixties. On board apart from myself, Roy, was the DJ from the well- respected Plymouth rock club ‘Van Dike’, Derek, with his wife Anne. There was also another couple, Pamela and Malcolm, plus two other free souls, Patrick and Robbie. What really drew us together in the first place was Van Dike, a now legendary club that has its own Facebook following. An incredible amount of the top rock acts of the time, including Kevin Ayers, performed at the club and after it had closed, the Plymouth Guildhall. It was on the way down to Spain that Patrick noticed in a French rock magazine that there was a Festival at Arles and although it was interesting it didn’t involve much discussion as we were off to Spain and the sunshine. It was a very hot summer and our stay, camping at Playa D’Aro, where we had ended up in Spain, was fun but at times uncomfortably hot. There was enough going on with the beach, bars and an all-night club to keep us occupied but after a while it became too hot. We decided to move a little north to the South of France. We arrived in France and started looking to camp in the Marseille area, but if I remember we’d have to camp quite a bit outside of the town. It was then that Patrick remembered Arles and we suggested a detour there on the way back to Brittany. We found a great little campsite, this time with a swimming pool, and set up tent. Roy continues : “It’s often said that if you remember the sixties [and the seventies] then you weren’t there. Well, we’re all still friends with several [of us] living locally to Plymouth and others on Facebook. I contacted them to get their memories of the show. Sadly Patrick, who discovered the gig, has passed on but as for the rest of us our memories are blurred. I remember somehow getting past security on to the side of the stage during Nico’s performance. I didn’t have a telephoto lens, fast film or flash so I rested the camera on a speaker to provide support and shot my transparencies on Agfachrome. Nonetheless we are very grateful to Roy and his friends for sharing their memories with us. It’s been interesting to go back in time and to consider the muse-poet-musician relationship between Kevin and Nico. 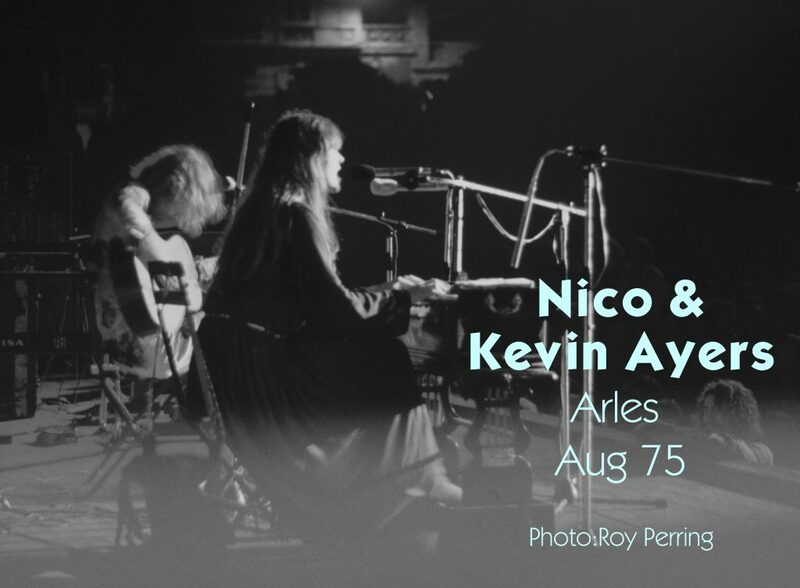 Other eyewitness accounts of Kevin’s performance in Arles on August 6th, 1975 describe him as “trying to accompany Nico on a couple of songs”, that the music was a little “hit and miss”. Kevin and Nico were “very sweet together”and it seems possible that Kevin may have had a drink or two before going on stage. In many ways it’s surprising that the two performers weren’t supported by a full band at such a large event. 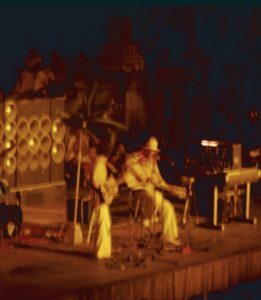 Here at KevinAyers.org we would love to hear from anyone else who was at this gig and also to solve the riddle of the unknown guitarist. For further reading about Nico on Wikipedia click here. So when’s the biography due? Sorry, but realise of this festival was never in arenes d’Arles, but in théatre antique d’Arles. This is not the same. Very different. I was here. I had 26 at this moment. The program was; ASH RA TEMPLE/KEVIN AYERS/NICO/CAN. GONG was previously but not présent. they cancelled. Désolé, mais ce festival N’a jamais eu lieu aux arènes d’Arles, mais au théatre antique d’Arles. Ce qui n’est pas la même chose; Le lieu est vraiment different. J’Y étais. J’avais 26 ans. Le programme était; ASH RA TEMPLE/KEVIN AYERS/NICO/CAN. GONG était prévu mais a annulé! Hi, nice read, thanks. You may already know that this was recorded, and just yesterday a torrent of the set was available for download on the ‘dime-a-dozen’ website. The CAN set from this show also circulates, in the form of a beautifully ambient audience recording. One of the best recorded live performances of that band, in my view. Can you tell me where to find the recording of Kevin`s Arles concert that is mentioned here….also of other live recordings that contain “Big Bamboo” and “England”, which I believe KA did at the Canterbury festval….? Obviously it would be a great idea if we added the audio to the article above. I will put it on the “to do list for 2019”!